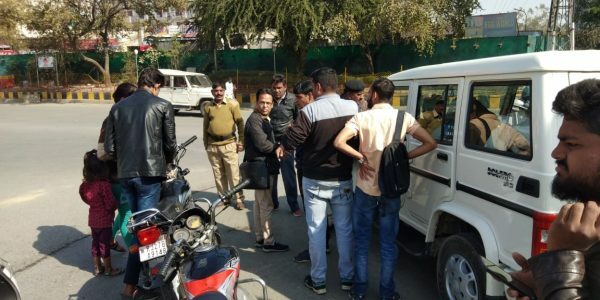 Udaipur : To have a reality check about the 30th road safety week, being observed in the district, Rajsamand SP Bhuwan Bhushan Yadav undertook a decoy operation on wednesday. The police officer dressed in civil clothes with a mask on his face, rode on the city roads for some 3 kilometers on a motorbike with two men seated behind him. He crossed 9 traffic check points, at one of the junction, the SP was stopped by an ASI who turned down a bribe offer and demanded him to pay the penalty for traffic rules violation. The ASI Ratan Singh Chundawat couldnt identify the officer as the latter didnt remove the mask from his face. Yadav went sideways and called his personal assistant to ask the ASI to let them go without telling him about the decoy operation. When the SP’s secretary called Ratan Singh Chundawat, he refused blatantly claiming that the rider violated major traffic rules. The caller persuaded the ASI and asked him to let the men go and said that the reason would be told to him later. Yadav rode around the city for some two hours and checked the functioning of the traffic team. At Kankroli chopati junction a constable warned the officer not to ride without helmet and not drive with more than two persons on a motorcycle. Few cops were not present at their duty point while some appeared in an easy going mood. Later, the SP appreciated ASI Ratan Singh Chundawat for his diligence and recommended for a cash prize of 151 rupees and a certificate. Other cop Shankarlal and Gautam too were recommended for their honesty while constable Rajesh Meena at Rajnagar circle was given a chargesheet for negligence. One head constable and two constables were given a punishment to run with their gun in the police line for two hours daily. 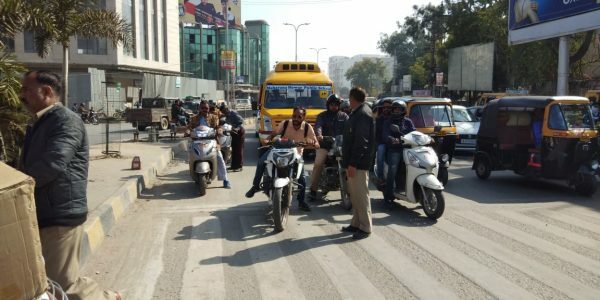 Pics :Traffic police in several junctions in Udaipur city on Thursday were seen advising commuters to use helmets, many were fined.